Intel and Google unveiled a new line of Chromebooks today at IDF 2013, and it sounds like they'll pack something of a punch. With the Haswell chip on board, the next-generation Chromebooks offer better battery life and improved performance, according to Intel. The Haswell microarchitecture uses less power, which according to a Google blog post effectively doubles the new Chromebooks' battery life. This generation of Chrome-based computers is pouring in from a variety of manufacturers, with Chromebooks coming from Acer, HP, and Toshiba, with Asus putting out a Chromebox. Specific hardware details weren't squeezed out, but the devices should be available in the coming months. Unlike Acer and HP, Toshiba and Asus are new to Chrome hardware manufacturing. With those two in the mix, six top laptop manufacturers will soon be offering Chrome-based hardware, Google noted. The search company offered descriptions for each new entry, as well. 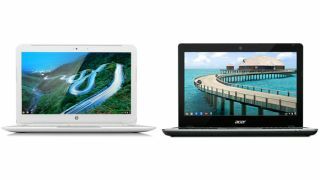 The Acer Chromebook is "light and portable," for example, while the HP Chromebook 14 has a large display and comes in a variety of colors. The Toshiba Chromebook is versatile and portable, Google effused, while the Asus Chromebox is "suitable anywhere you need a computer," whatever that means. Google also offered some figures from NPD. According to the research firm Chromebooks represent 20% to 25% of all computers that are $300 (about £189, AU$321) or less. In addition, over 5,000 schools, representing more than a fifth of all U.S. school districts, have adopted Chromebooks for their students. Google's hub pages for the new Acer Chromebook and the HP Chromebook 14 say that the laptops will be available in select countries. HP revealed in a separate announcement that it expects to ship the Chromebook 14 for $299 (about £188, AU$320) before the holidays. Likewise, Acer's new Chromebook will launch before the holidays, the company told TechRadar, though there's no pricing info yet. TechRadar asked Asus, Toshiba and Google for more about the other new Chromebooks' availability, and we'll update this story when we hear back. TechRadar laid out 10 things Google should fix on the Chromebook - think the new generation will address these issues?